KAABOO Del Mar is returning to San Diego on September 15-17, 2017, with plenty of music, food, arts, comedy, drinks and more! KAABOO’s world class music lineup spans Rock, Pop, Electronica and Hip Hop. The 2017 lineup includes everyone from Alt Rock legends and bucket list acts, to today’s hottest hitmakers and incredible up-and-comers. See acts including Red Hot Chili Peppers, P!NK, Tom Petty and the Heartbreaks, Muse, Jason DeRulo, Kesha, X Ambassadors and nearly 100 more acts. We know funny and are proud to host some of the biggest names in comedy, including Sebastian Maniscalco, David Spade, Arsenio Hall and many more. Look beyond the flavorless giant slice – we offer gourmet eats from renowned restaurants and chefs. A feast for your eyes, KAABOO offers cutting-edge art exhibitions including large-scale outdoor murals and installations, plus a large contemporary indoor art show featuring over 80 artists and galleries, with all works for sale. Without a porta-potty in sight or an endless field of tents, you aren’t roughing it here. KAABOO is located adjacent to the Pacific where fans are treated to gentle San Diego ocean breezes in an elevated festival setting. Catch the party wave in BASK, presented in partnership with MGM Grand’s Wet Republic. Our Vegas-style day club offers weekend passes or private cabanas for rent. Splash around while enjoying all the action on the Synchrony Financial Grandview Stage. Weekend passes and cabanas are still available. Dance the night away in CLUB ELEVATE, presented in partnership with MGM Grand’s Jewel Nightclub. Stay late and dance to well-known DJs, or secure a table with bottle service to catch the action from your own private table. Easy access! KAABOO’s new and improved Rideshare and re-designed parking program will allow for easy-in / easy-out. 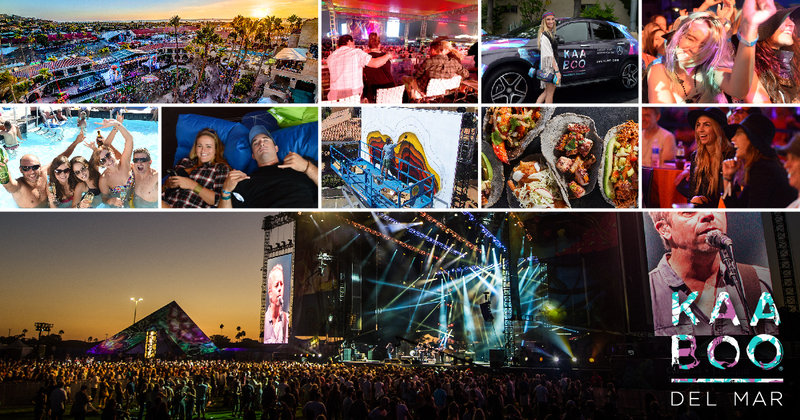 KAABOO’s Uber Rideshare Zone will offer late night bites, beverages and entertainment while you wait for your driver with an assigned location! A VIP experience for all! All guests at KAABOO receive an elevated guest experience, but our AMPLIFY program includes preferred viewing and additional access for the HANG FIVE and HANG TEN guests. KAABOO is located in beautiful Del Mar where the Southern California Vibe makes it an epic weekend getaway! See you there! This entry was posted in San Diego Events by Brent Bernasconi. Bookmark the permalink.